Some time ago, I had reviewed VidCoder (click here ) giving it two thumbs up as the easy-to-use portable freeware offers audio/video (AV) conversions supporting myriad formats, video editing and customizations. Thus, you may ask why XMedia Recode  (XMR) when VidCoder is basically capable of doing the same job. Oh well, VidCoder is great, but within its own limitations. XMR may work for you better or worse, or as a good alternative. On top of that, if you have an antivirus like Symantec Endpoint Protection, you may not feel lucky with VidCoder as it turns out the latest stable 64 bit portable version of VidCoder (2.62) is not allowed by Symantec (the app cannot even be launched). So, is XMR worth considering? Let’s find it out! As the name implies, XMR is an AV converter (aka re-encoder or transcoder) for the most widespread, widely supported, user-friendly, modern formats, includes convenient profiles for popular mobile devices from the brands, viz., Apple, Samsung, LG, Sony, etc., and implements subtitles, chapters, and the other options. Profile support: Custom, Favorites, DVD Player (Standalone), HTML5, YouTube, multiple vendors, etc. 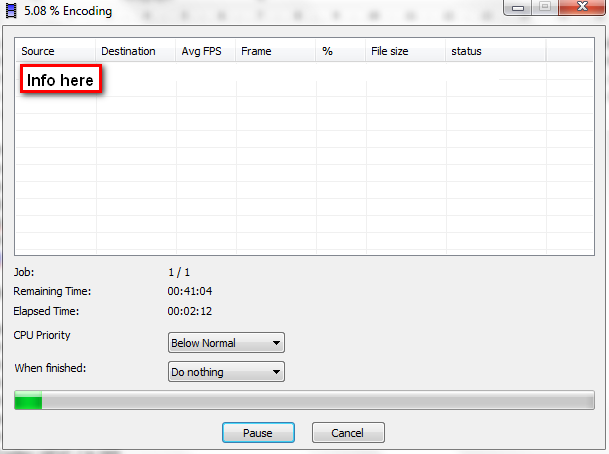 Video encoding: Some facts: Must read (click here ) if you are new to encoding. Disclaimer: Video conversion/encoding/re-encoding/transcoding may or may not be legal in your country. Please check before you proceed. 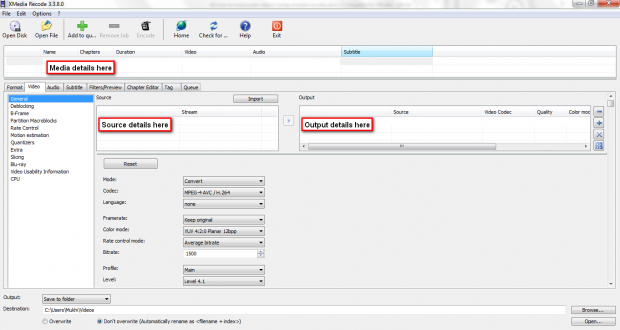 Format: Customize the ‘Output Format’ here. Specify the ‘Profile’ and the ‘Format’ from the drop-down menus as you need (the ‘File Extension’ will be changing automatically). For instance, if the ‘Format’ is changed to MP4, the ‘File Extension’ will be mp4 accordingly, and some more tabs like Chapter Editor, Tag will show up. The ‘Output stream type’ may be Video and Audio or Video only or Audio only. 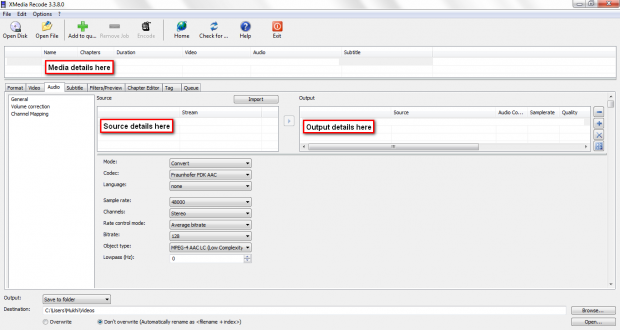 ‘The Audio / Video synchronisation’ is checked by default. 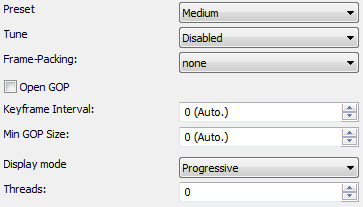 If you want your output compatibility to your device like the one from Apple, Samsung, Dell, Acer…, then select the desired ‘Profile’ first (aka preset). These predefined selections include (but not limited to) file format, screen size specific to a given hardware. If you are not too worried about compatibility (e.g., the latest Android devices with a media player like VLC or MX Player virtually play anything that you throw in), the default ‘Profile’ Custom can be just fine. Video: This tab allows you to handpick the video parameters, say, ‘Codec’, ‘Rate control mode’, and so on (view the screenshots below). The ‘Codec’ has to do with video compressibility, compatibility and customizability, whereas the ‘Rate control mode’ talks about video quality and size. There is a Bitrate-Calculator (from the Options menu at the top of the XMR window). 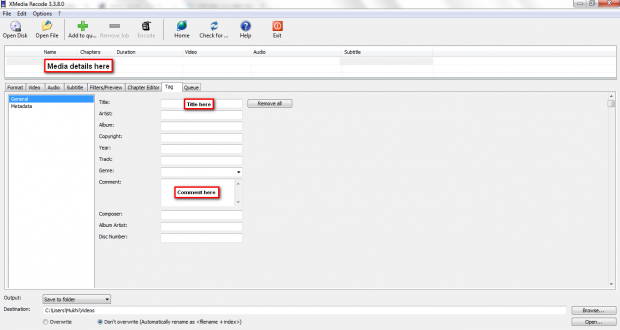 The direct stream copy option copies the video stream only into the target (change the ‘Mode’ from Convert to Copy). Thankfully, numerous choices that you may be able to play with exist here in this tab. However, if you don’t know what you are doing, don’t do it here! Audio: You may choose ‘Codec’, ‘Bitrate’, and/or the other audio related variables here (see the screenshot below). The direct stream copy option copies the audio stream only into the target (change the ‘Mode’ from Convert to Copy). Subtitle: If your source has subtitles, it will be displayed in this tab (look into the screenshot underneath). If the subtitle is softcoded (not embedded in the video), it can be included in the destination file at will; if hardcoded (embedded in the video), it will spontaneously appear in the output video. You may also import a subtitle file like srt. You can add up to 32 subtitle tracks. Filters/Preview: You will be able to preview (play the whole video, or customize & play a small clip). The video editing is possible to a good extent given that plenty of filters are available (vide the screenshot below). ‘Keep aspect ratio’ is checked by default; leave it like that; else, your final video may look weird. ‘Crop’ should be Auto Crop if you would like to avoid the black bars. The video editing offer in XMR includes, but not limited to, Color correction, Denoise, Delogo, Deblocking, Deinterlace, Flip Image, ‘Start Time’, end time, Rotate, Sepia, Sharpness, Padding, Video fade in / fade out. Neophytes are recommended not to mess around with any other parameters in this tab. 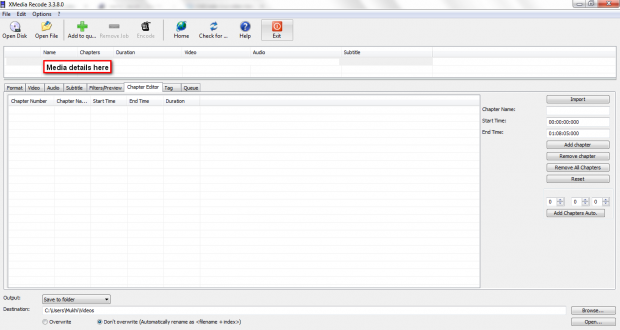 Chapter Editor: The screenshot below indicates how the chapters may be managed. You can automatically create chapters. 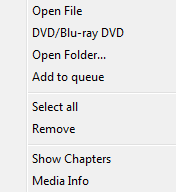 The chapters from the discs can be taken over automatically. Importing the chapter files (text) is another possibility. Tag: If tagging is important to you, this tab helps (screenshot as follows). Adding album covers and editing ID3 tags are supported. Queue: The Queue tab doesn’t add info (like the screenshot below) until you click Add to queue (or Edit > Add to queue) once you are decided on the specifications. The ‘Destination’ of your choice (your favorite folder or directory for the output; just remember that it must exist beforehand as XMR won’t create it for you, and would not like either an address that doesn’t already exist) may be had by manually typing/editing the address in the box right to the ‘Destination’ text found at the bottom of the XMR window, or clicking Browse. Your ‘Output’ may also go to the Input Folder. To make sure that you don’t ‘Overwrite’ by mistake, the default is ‘Don’t overwrite (Automatically rename as <filename + index>)’. Like I said in the beginning, you may prefer XMR (or stick to VidCoder), or try it as a substitute. In the past (previous versions), XMR disappointed me, but this new version seems to be working and promising. You will be right in saying that it still has limitations; for example, it doesn’t do 10 bit encoding, or work on encrypted discs, or support 4K/UHD (Ultra-High-Definition) HDR (High Data Rate) output, but folks, there barely exist freeware I know that do have all of these options. So, would you like to try XMedia Recode (if not done already)? Questions or troubleshooting? Let us know in the comments!